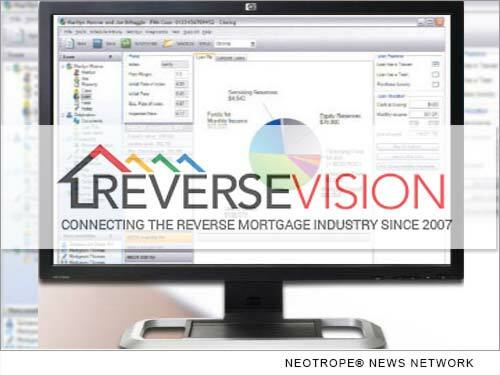 SAN DIEGO, Calif. /California Newswire/ — ReverseVision, the leading provider of software and technology for the reverse mortgage industry, today announced the expansion of its RV University (RVU) education and training program with the addition of a three-day Accelerated Loan Originator Training course available live each month at ReverseVision’s San Diego training facility. Launched in March, the live training course is specifically designed for loan originators and processors looking for quality Home Equity Conversion Mortgage (HECM) education and software training. Both front-line originators and managers will benefit from programming designed to accelerate the HECM origination process and position companies to achieve optimum results. ReverseVision will offer the course on a monthly basis and is currently accepting enrollment for its May and June sessions. The three-day session covers all facets of HECM education, beginning with a primer on loan structure and regulatory guidelines on day one. Day two gives students hands-on practice preparing proposals and disclosures for various origination scenarios using ReverseVision technology. On the final day of the training, attendees learn compliant and successful sales methods for describing HECM loans to a range of borrowers and referral partners. Mickey Cunningham, an experienced forward loan originator with Gateway Mortgage Group, is one of 11 students who attended the first Accelerated Loan Originator Training session in March. Gateway Mortgage Group is among the largest privately held mortgage bankers in the country. Christina Harmes, assistant manager of C2 Financial’s reverse mortgage division, also attended the session. C2 is the largest mortgage broker in California and second-largest broker in the United States. ReverseVision has offered 24/7 online training through its RVU platform for the last three years. RVU’s online classes remain an affordable option for mortgage lenders seeking introductory and “refresher” HECM education. In addition, select courses qualify attendees to earn credits toward Nationwide Multi-State Licensing System (NMLS) and Certified Reverse Mortgage Professional (CRMP) continuing education requirements. The CRMP program, administered by the National Reverse Mortgage Lenders Association (NRMLA), is the highest industry credential for reverse mortgage professionals. To register for Accelerated Loan Originator Training or another RVU course, visit http://rvu.reversevision.com/.